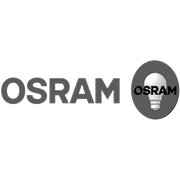 OSRAM LED Glass Gu10 7w globe in Warm White colour with 400 Lumen output in a convenient pack of 3. 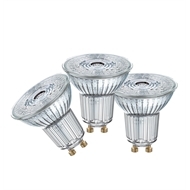 Easy replacement of halogen lamps due to compact full glass design and single optic. Free of multiple shadows for an excellent accent lighting. Up to 85% energy saving, with high colour consistency. Install and forget with low maintenance assured by Germany quality standard.